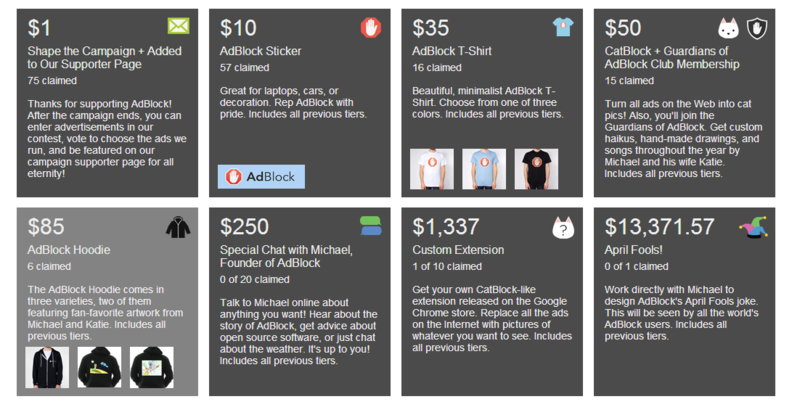 AdBlock, the company behind the AdBlock Chrome extension that block out Internet advertising, is going meta after it launched a crowdfunding initiative to raise a minimum of $25,000 for an advertising campaign of its own. AdBlock has launched the Kickstarter/Indiegogo-style 30 day donation push to finance a promotional campaign that will use the very medium that it restricts: Web ads. The donation page quietly went live this weekend — crossing $4,000 at the time of writing — but AdBlock says it will push a notice to users of its services this coming week to generate further interest. It expects that alert to users to drive around 15 million visitors to the campaign page, which includes a variety of donation packages, priced upwards of $1. Like Kickstarter and Indiegogo, donors will only pay if the minimum target is reached. There is an ambition to make its campaign more visible, and AdBlock says it will rent a billboard on Times Square if it can bring in $50,000 in donations. If the amount reaches $150,000, it wants a full page spread in the New York Times — while, at the crazy end of of crazy, it’s pledging a Super Bowl 2014 TV spot if it can pull in a highly unlikely $4.2 million. AdBlock says it can make the Internet “a better place for everyone” if it cuts out “annoying” advertising. While that may appeal to some, many Internet sites — The Next Web included — rely on advertising to bring in revenue, which pays for staff to write content — so cutting out ads is very much detrimental to many content creators. One argument to justify services like AdBlock is that that online media should develop better business models that are not reliant on ads. While that’s all well and good on paper, it remains to be seen how many Internet users will pay for anything — let alone news and content — which they are used to getting for free; while other monetization models are still to come to the fore. Bearing those arguments in mind, it will be interesting to see how AdBlock’s campaign progresses. UPDATE: A previous version of this post conflated the AdBlock and AdBlock Plus brands. The post has now been amended to remove this error. AdBlock Plus is a separate company to AdBlock. Read next: Why are Apple, Google, Microsoft and Samsung so interested in Best Buy?